They say you can't have everything in life. Click here to play! Maybe that's true if you're poor, but if you go from Rags to Riches, the world is your oyster! Throw down that hobo bindle and jump into the Rags to Riches traditional slots game to play for a whole new life of fortune and easy living. 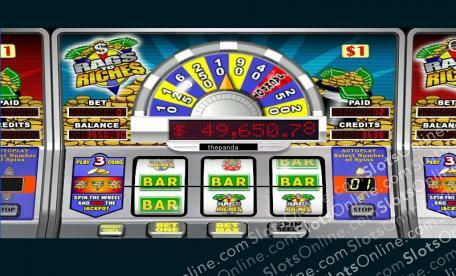 The Rags to Riches slots are easy to play. Simple bet 1, 2 or 3 coins and spin the reels. For each coin you bet, the potential prizes increase substantially. It's a really simple game, as there is only 1 payline and 3 reels. You just decide on how much you want to bet and then leave the rest to fate. Here's hoping fortune favors you in your quest to go from Rags to Riches.